19 Sep 2013 in fantasy magic romance sarah beth durst suspense young adult books ~ read. Eve remembers nothing. No past, and not even any recent memories. Eve isn’t even her real name – she has no idea who she really is. All she knows is that she’s in the witness protection program, and that she can do magic. Any use of magic, though, causes incapacitating visions of a strange carnival, and a Magician and a Storyteller. Eve begins to suspect that the visions are actually memories, but who are the Magician and the Storyteller? And more important, who is Eve? A magical serial killer is on the loose, and Eve may be the key to finding him, if only she can remember in time. As Eve tries to unravel the mystery of her life, it becomes increasingly difficult to know who she can trust. The Witsec agents? Patti, the library manager? Zach, the boy in the library that she wants to kiss? Or handsome, cocky Aidan, who has magic of his own? It seems that everyone has their own idea of what Eve should be doing. But in order to decide what to do, Eve must first figure out who she is. Review: Conjured is an exquisitely crafted book that stands out for its tight writing, unique story, and intriguing character arc. Durst obviously spent time and care on the writing: every word is carefully chosen and rich with meaning, from smells, sounds and colors, to the use of point of view. It must have been exceptionally difficult to write a character who is essentially a tabula rasa at the beginning, and do it in an engaging way, but Durst succeeded admirably. Eve is engaging, and the reader becomes her as her character journey unfolds. An important theme of this book is defining who you are for yourself, rather than allowing your past or other people to define who you are. 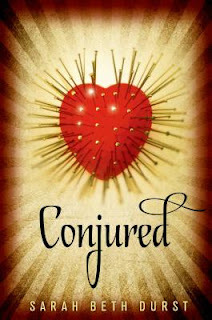 Conjured is mysterious, suspenseful, and oh so creepy. The descriptions are evocative and convey a strong sense of atmosphere, whether the deliciously comforting atmosphere in the library where Eve works, (obviously written by a book lover!) or the bizarre and creepy atmosphere in her visions. Put this in the hands of anyone who enjoys the creepy, mysterious, and atmospheric books, or someone who is just looking for something a little bit different.